Address: Pop Brixton, 49 Station Road. On a wet and windy Friday, nothing in the cupboard and no inclination to face the rain, so we ordered Deliveroo to do it for us and went for Pizza from Made of Dough. This is a kiosk in Pop Brixton with a very limited menu, which makes it easy to make a choice. The pizza style is described as proper Neapolitan pizza with a nod to Southern Spain and is produced by a an Italian from Campania (where the best mozzarella comes from) and a Spaniard from Andalusia. Both of which are great for us. 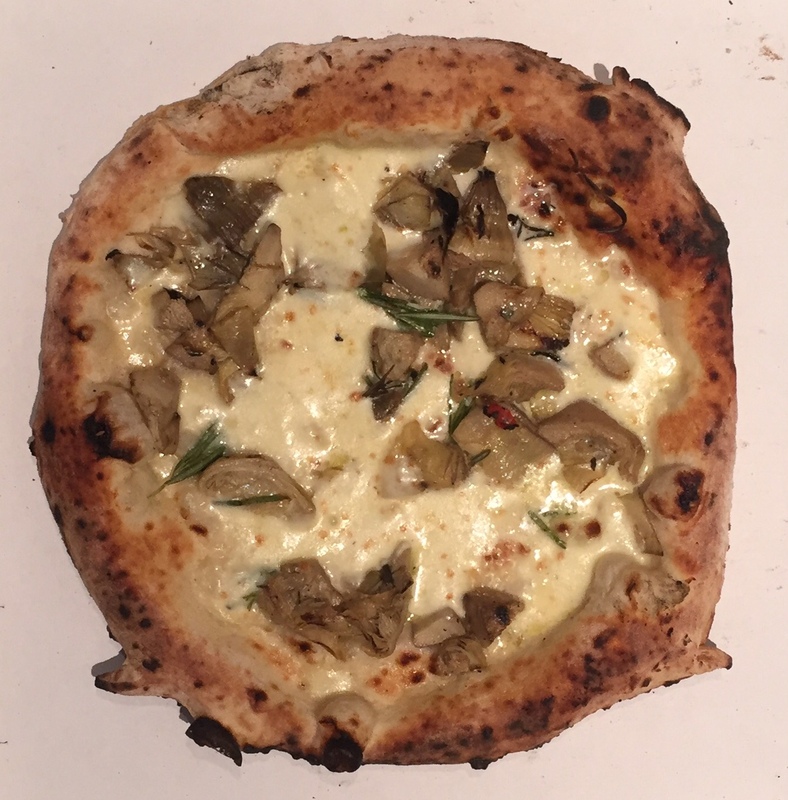 There are only five pizzas on the menu from the usual Margherita, to the more exotic “Truffle” (portobello mushroom, fior di latte, white alba truffle oil & burrata).. We chose the Artichoke, which is pale and has fresh grilled artichoke hearts, fior di latte, rosemary & garlic oil (no tomato). Fior di latte is a very soft cheese made from cow’s milk in the style of mozzarella and melts well on pizza. 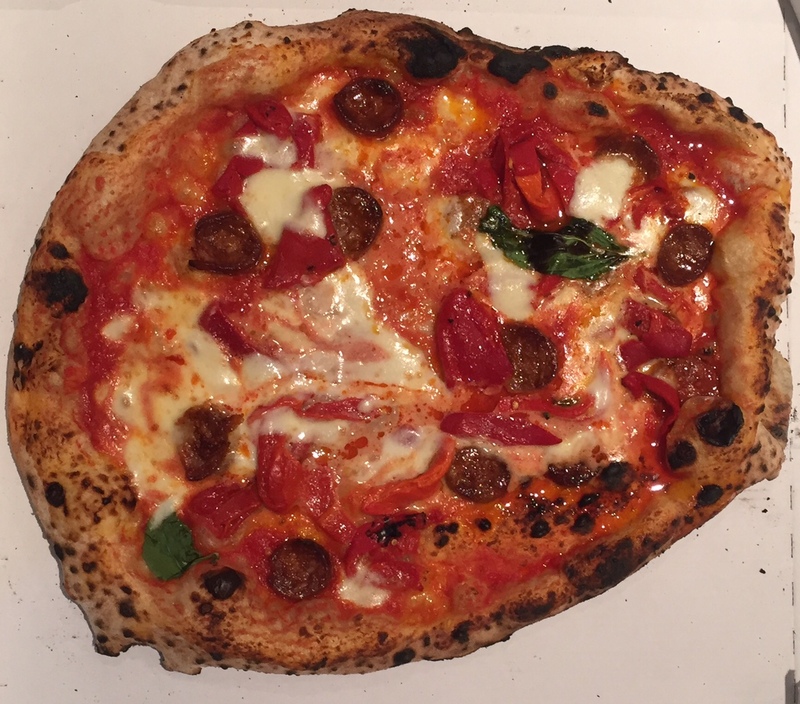 The other was a Chorizo (Brindisa chorizo & piquillo peppers on a margherita), so a bit more like an American Hot. We liked them both but they weren’t great. The Artichoke was a bit boring but the base was lovely. The Chorizo was burnt on the bottom and if we had bought it in person we would have sent it back – but the topping was lovely. So guys you just need a bit of quality control. A bit more garlic on the Artichoke and care taken not to overcook the dough. We will try them again because I definitely want to try the Truffle one but will probably visit them rather than await Deliveroo. The bill was around £16 for the two pizzas.